Last week both of my little boys had their birthdays. Yup, December is a super busy month for us LOL. So, Christian has already had a dinosaur birthday party, but that was before Dylan was born. Dinosaurs are Dylan's favorite! 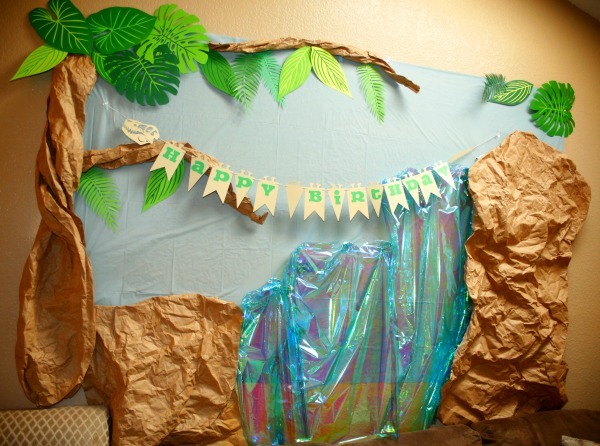 Since they both love dinosaurs, I decided to throw another dinosaur themed birthday party. I knew I wanted to have murals on 2 of my walls for this party. I wanted them both to look prehistoric and take up most of the wall. For both murals I started off with a light blue plastic table cloth for the sky. 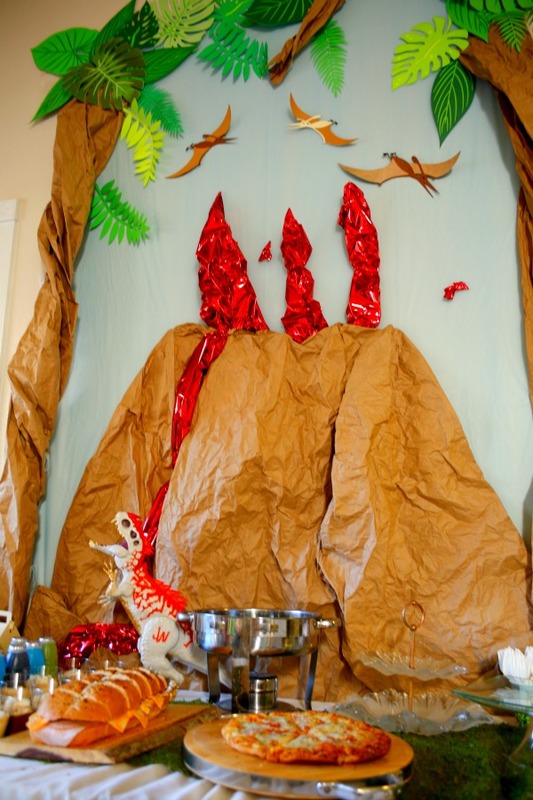 Then I crumpled up brown shipping paper to make a volcano, waterfall and tree trunks. 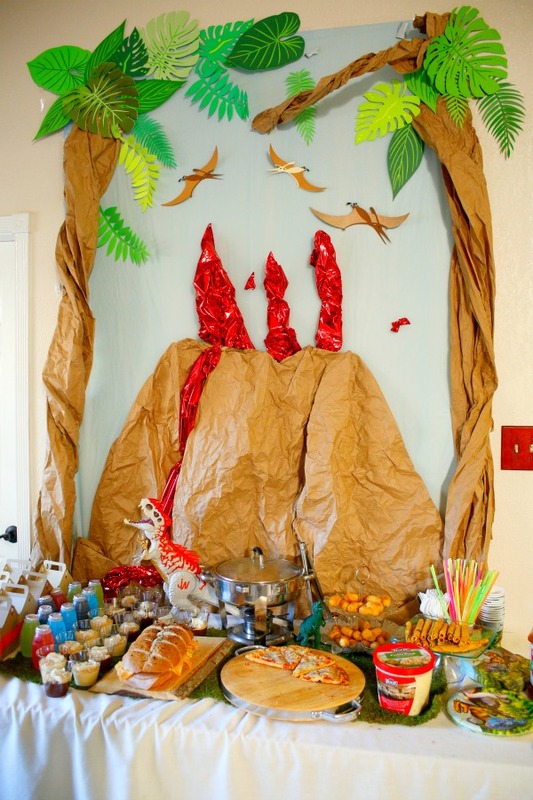 For the lava in the volcano, I crumpled up red metallic gift wrap. The water in the waterfall is crumpled up blue tinted cellophane. 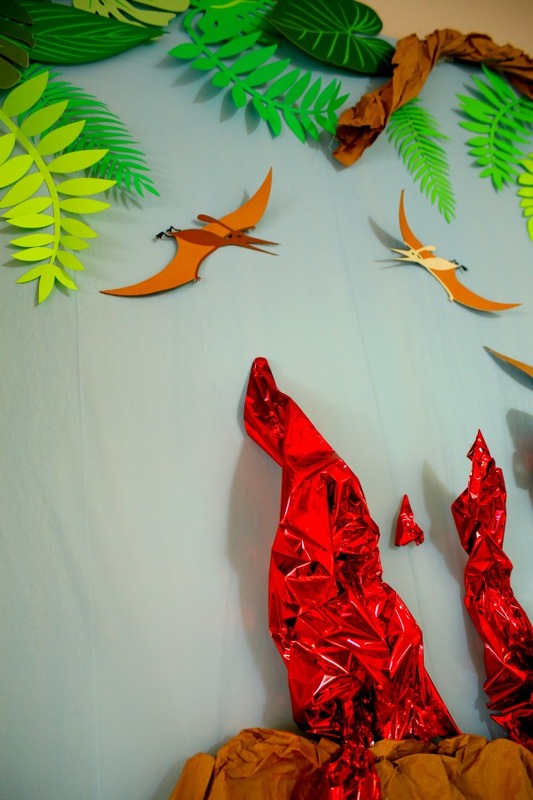 For both of the murals, I made a ton of leaves using my Cricut Explore One™. 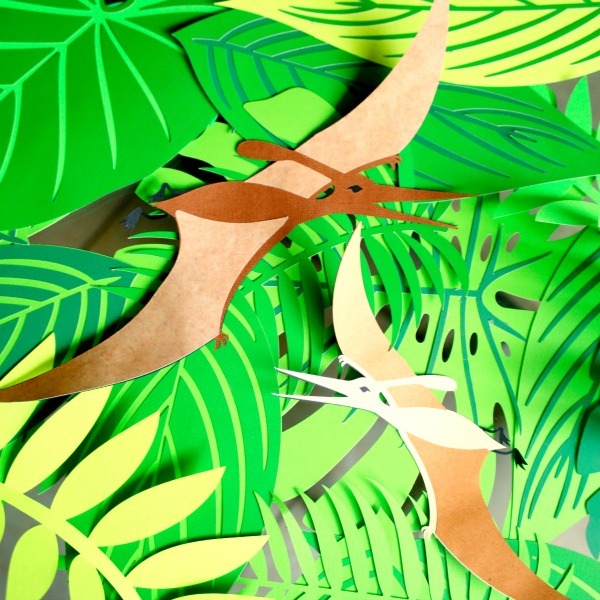 I also made the pterodactyls for over the volcano. 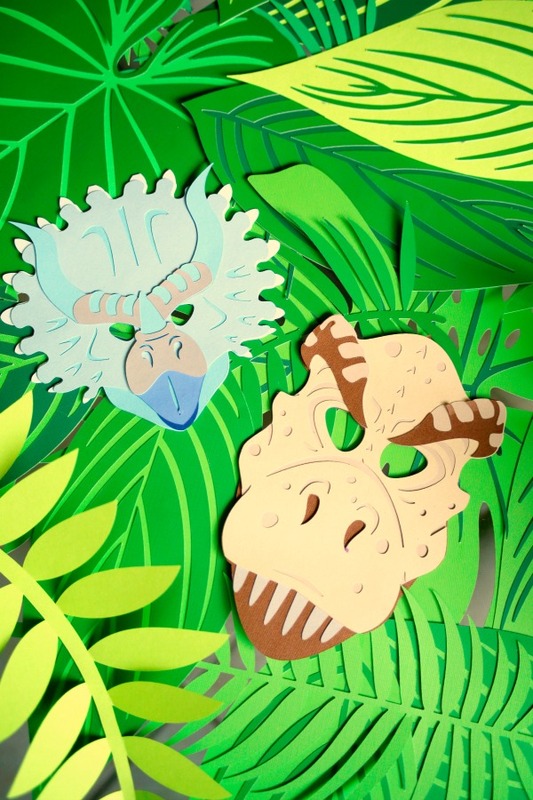 And I made dino masks for the kids with my Cricut Explore One™. 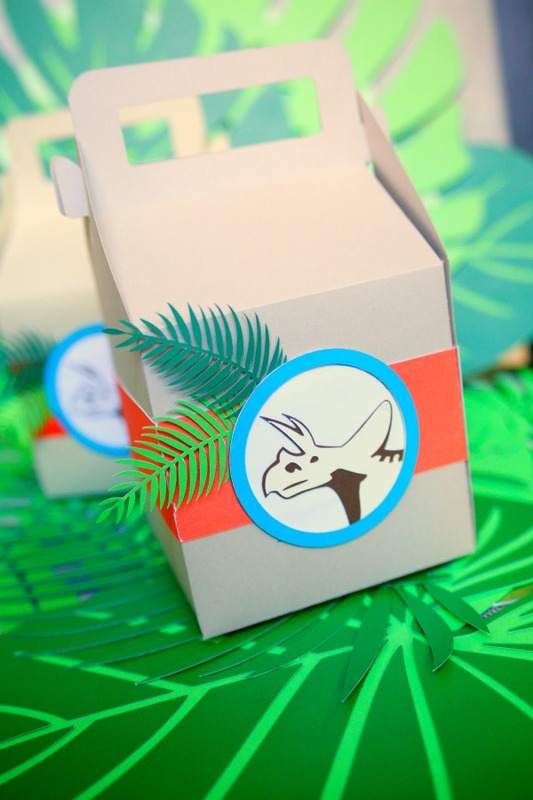 Also using my Cricut Explore One™, I made treat boxes for the kiddos to take home with them. They have prehistoric insect toys, candy and dino tattoos inside. 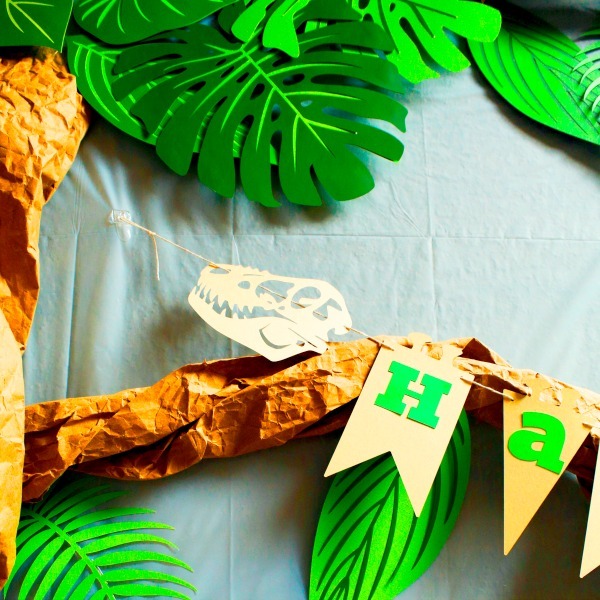 I'm so in love with this dinosaur bone birthday banner, I'm going to make some more with the boys' names on them for their room. My little guys had gotten a dinosaur ice mold as a present once. I decided to use it to mold white candy wafers for these pudding cups. 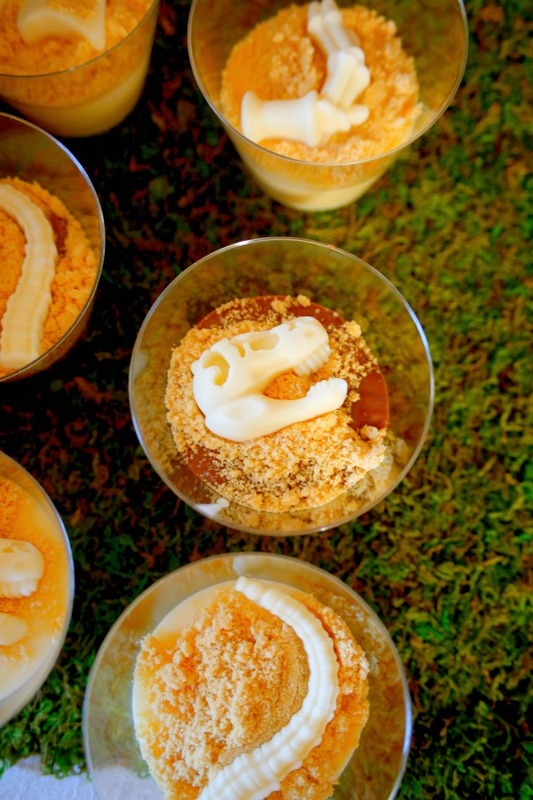 I poured pudding into individual cups, and spooned crumbled vanilla cookies on top to look like the white chocolate dinosaur bones were buried in sand. 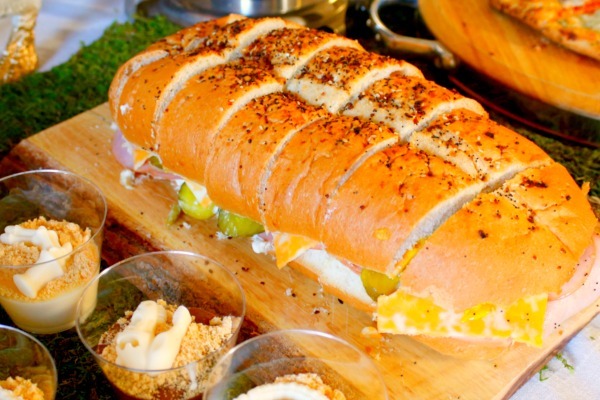 Making 1 or 2 large sub sandwiches is a party standard for me. 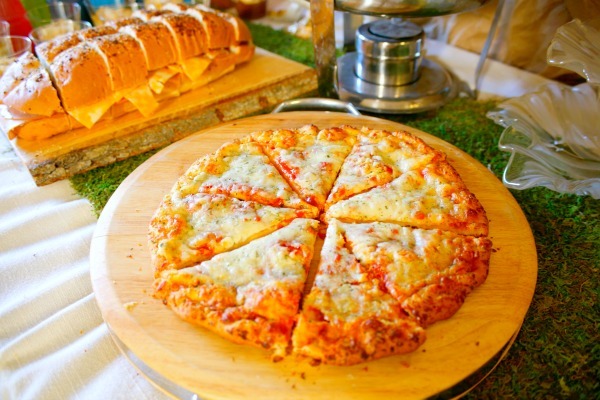 What little kid doesn't love pizza? I bought a bunch of frozen pizzas, so about every half hour or so, my guests could help themselves to a fresh bubbly pizza slice. We also had taquitos and dinosaur shaped chicken nuggets. 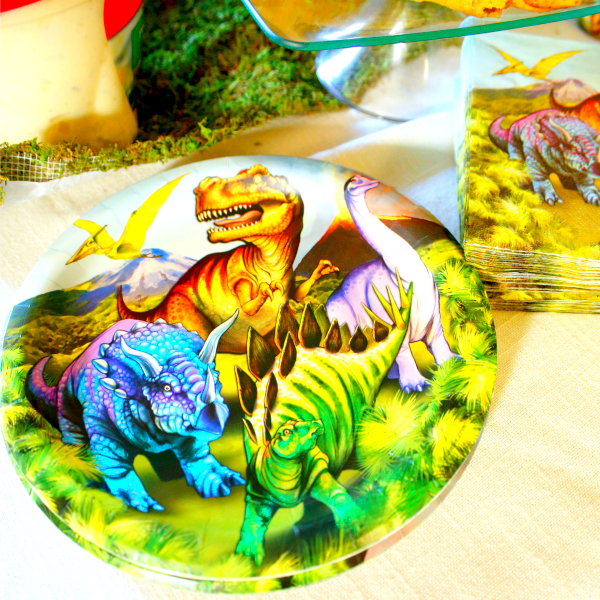 I was surprised at how few dinosaur party items I could find around town, but I found these dino plates, cups and napkins at Wally World aka Walmart. 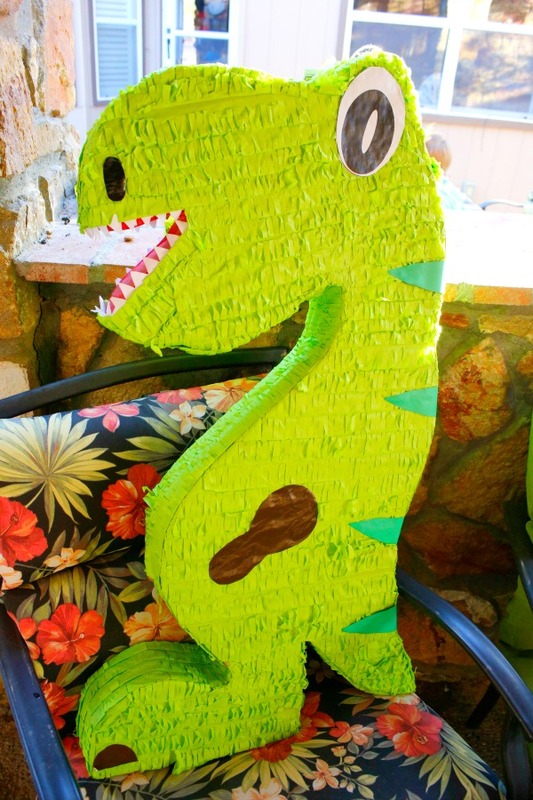 And also this pinata. The kids had so much fun whacking all of the candy out of him! 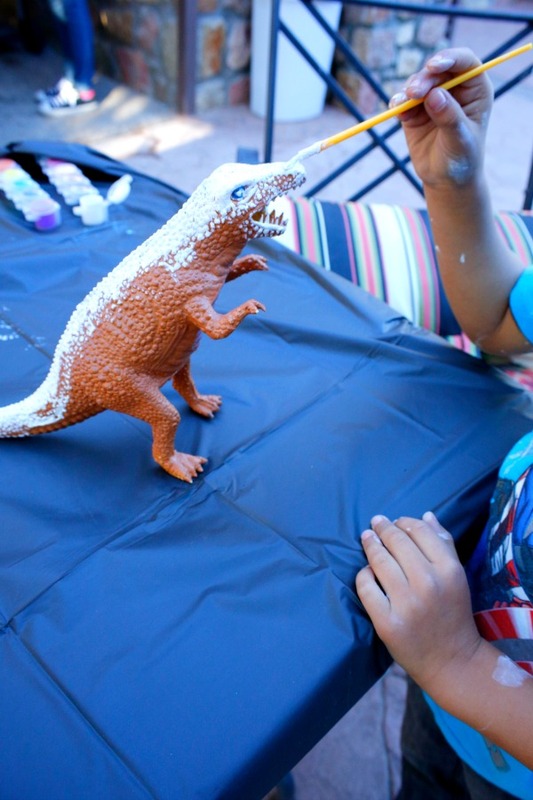 One of the activities we had for the kids was to paint dinosaurs. I bought a bunch of dinosaur toys from Dollar Tree and had intended on painting them white first. Fortunately the kids didn't seem to mind that I didn't get around to that step and they had fun painting their dinos anyway. 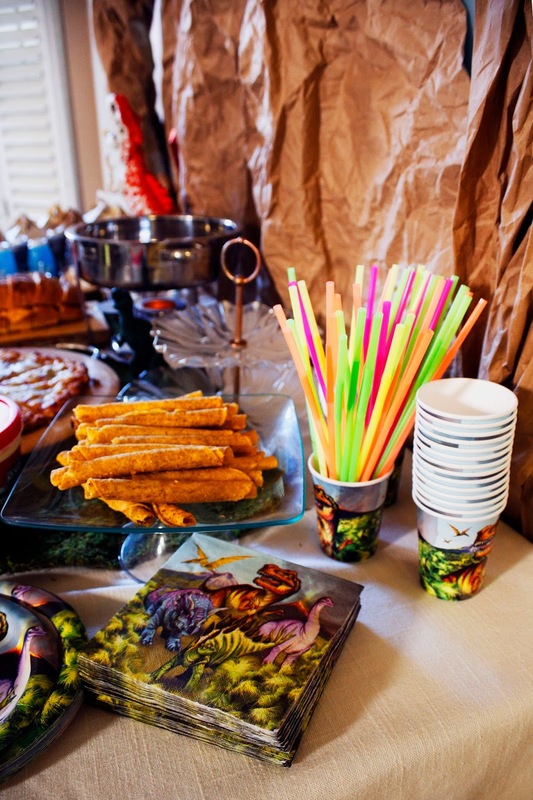 It was a great party, and I think the adults might have had even more fun than the kids did! 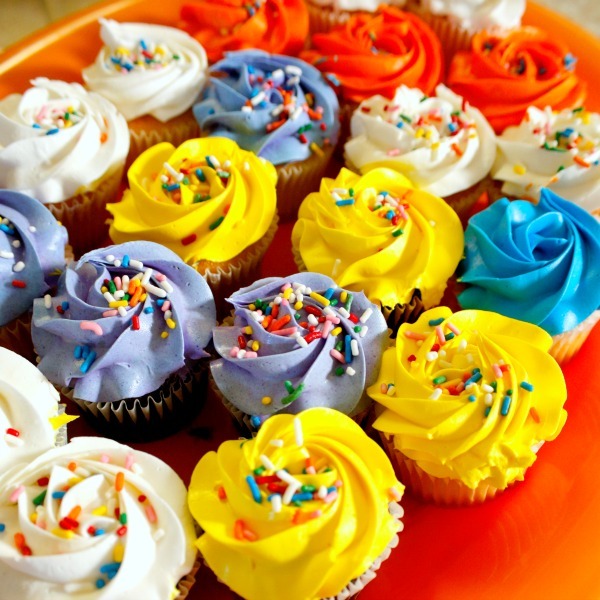 Well, another successful birthday party down in the books. Now I just need to figure out where to put all of their new toys! I have that same dino bone mold! I see a dinosaur party in our future. This would be super fun. 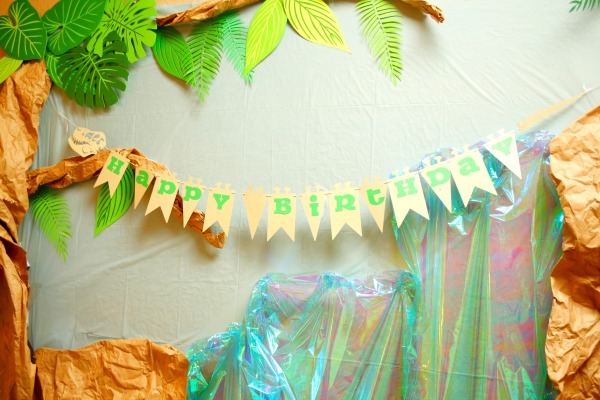 Linking up to this party on: http://halfpintpartydesign.com/holiday-decor-double-duty/ for March – green party ideas. 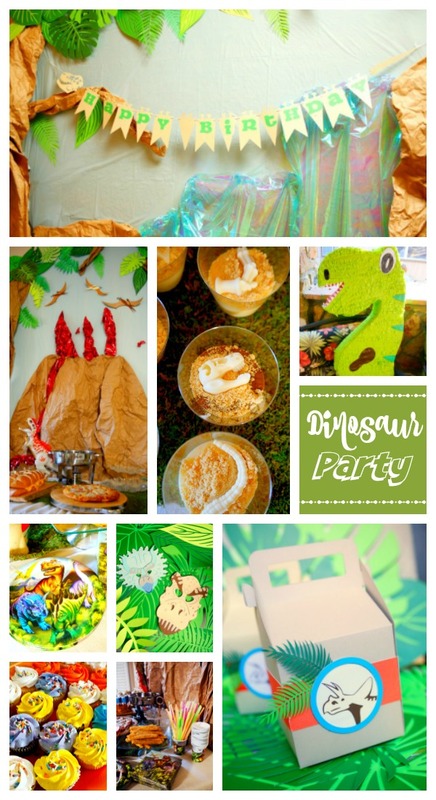 Thanks so much for these amazing Dino party ideas. My lil one will be 4 in 2 weeks and you’ve literally steered me in the right direction.